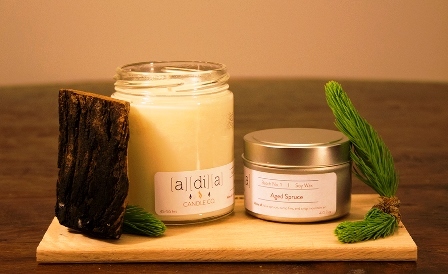 I’m back with some more delicious scents from the luxury candle company, Adia Candles. I had so much fun with the first set of candles, I couldn’t wait to dive into more of their scents. A secret passion of mine is to try every scent offering from every candle company I love. I’m well on my way with this company! Today I’m reviewing three more of their scents: Aged Spruce, Crafted Vanilla Noir, and Midday Mojito. For my initial review of Adia Candles, I reviewed three scents in beautiful, decorative bowls – link to that review here. This go-round, the candle vessels had a much more understated appearance. The three scents I’m reviewing were all in 8-oz candle jars – round jars with a twist-off silver lid and a small descriptive label on the front. The label was white and had the company name as well as the scent name with scent notes on each. Not easily removable, but possible if you wanted. The wax was white and there was a single wick, well-centered in all three. What did my Adia Candles smell like? I’m not a seasonal candle burner, so the fact that we were rounding Spring didn’t bother me one bit. I love tree scents and can really burn them year ’round. The cold sniff on Aged Spruce was much like I expected, but a little bit more. I could smell the scent of an evergreen tree with just a hint of smokiness to it. This candle is perfect for bringing in the bright outdoors on a rainy day or just crafting the mood around the holidays. It is fresh spruce accompanied with a skosh of campfire that is sure to clarify your mind and body. Campfire – yes!!! That’s EXACTLY what I was smelling. I was super excited to light this candle. Given its smaller size, I opted to burn this in my smallest bathroom. This turned out to be a great idea – the scent filled the room every time I walked in, making it smell like Christmas all over again! I think this scent would be good for any time of the year, though…not just the holidays. The cold sniff scent was much like it was when burning, only stronger. The smokiness didn’t overpower the tree scent at all. It was the perfect compliment. I happen to love all kinds of vanilla scents, so I was curious what this one would be like. Crafted Vanilla Noir marries the scents of amber, vanilla, and jasmine to create a subtle, mood setting ambiance. Being a warm, cozy scent, this candle is perfect for winding down at the end of the day. This sounded like a complex vanilla scent, and that it was! The cold sniff brought me mostly a soft, smooth vanilla scent. It didn’t smell bakery, like a cupcake. More sultry and mellow. When I lit this candle, that’s when the complexity shone through. 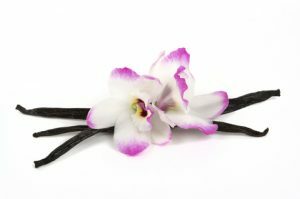 I smelled the same vanilla, but this time enveloped in a soft floral note. Jasmine!! What a beautiful combination! Oh, how I loved this scent. It was perfect for the bathroom, although it was a much softer scent than Aged Spruce. 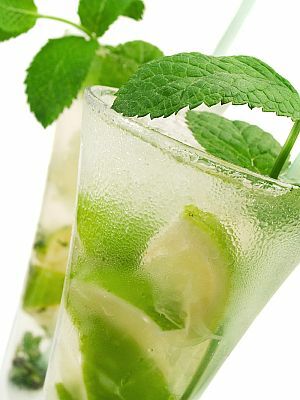 I haven’t tried a mojito in real life, but I’ve heard plenty of raves. That made me excited to cold sniff this one, and when I did – wowza! I smelled lime with a bit of sweetness. The scent was pretty powerful, but not overwhelming. A clean blend of mint, sugar, lime, and pineapple that freshens any room. Once burning, I found this scent was even better. All I could think was clean, clean, clean! This scent was so fresh and clean. The citrusy notes were so bright and crisp. I couldn’t really pick out the pineapple itself, but I knew I wasn’t smelling straight lime. It was lime with a twist, so to speak. This by far was my favorite of the bunch, and I found it to be the strongest. How did my Adia Candles burn? All three candles burned flawlessly. It did not take long to get a full wax melt pool on any of the candles, and there was no residual wax left on the sides of the jars as they burned down. The wicks on these candles were also fairly fragile once burned. Just take care when trimming them, or you’ll break off more than you want, leaving you with a nub. I didn’t notice any black soot when burning these either. I’m again impressed by the scents from Adia Candles. I’ll admit, when shopping luxury candles I am often expecting a step up in the packaging to help justify the cost – at least in my mind. That’s why I rate it a little harsher on the presentation side. Having said that, these three candles really blew me away with their complexity. Midday Mojito was my favorite, with the other two in a close tie. Midday Mojito was also the strongest of the scents, with Aged Spruce close behind. As expected, the vanilla scent (Crafted Vanilla Noir) was a softer scent. I would certainly purchase all three scents, probably in their decorative bowls.